May 14—In an hour-long lecture on April 21, South Africa’s former President, Jacob Zuma, reviewed the criminality and savagery of the British Empire, as visited upon South Africa in the first hundred years of British conquest. There is no precedent for such an address in South Africa. Former President Jacob Zuma delivers his address on April 21. For several years, the spokesman for the LaRouche movement in South Africa, Ramasimong Phillip Tsokolibane, has demanded that his nation break completely and decisively with the British Empire. Former President Zuma—in turning to the East, to China’s Belt and Road Initiative, and to the BRICS initiative of both Russia’s President Putin and China’s President Xi—had effectively moved in that recommended direction, but without speaking directly of the evil of the Empire,— until April 21. Observers on both sides of the imperial divide cannot help but notice the new congruence between what the LaRouche movement had been proposing and the remarks of the former President on April 21. Within this growing ferment against the British Empire, the attack on the LaRouche South Africa website—reported in this issue (page 28) [EIR publication as per top of page]—must be located as a sort of pathetic and obvious effort of the Empire to strike back. A portion of the audience at the event, sponsored by Black First Land First. Mr. Zuma’s remarks do not, however, bring the history forward to the present moment, in which a British puppet, Cyril Ramaphosa, has been installed in the Presidency. But as London and its thugs and pawns in South Africa fear, that is likely to come, as the global fight intensifies. In the meantime, anti-Empire patriots in South Africa—and everywhere—can turn to this journal for their ammunition. 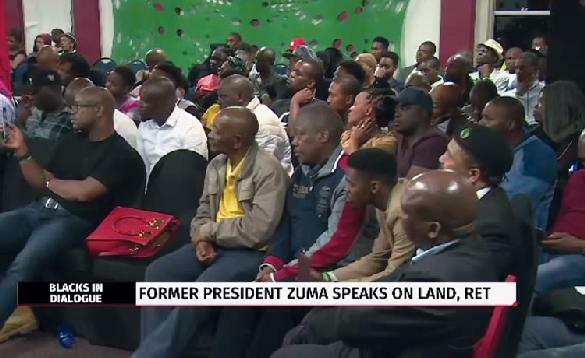 Video of former President Zuma’s address, posted on the African News Network (ANN7) website, was suppressed within a few days of its appearance, and ANN7 itself has not survived, for related reasons. Here is EIR’s edited transcript, with subheads added, of the first 36 minutes of Mr. Zuma’s address—the portion in which he attacks the British Empire. EIR is now making the [video of the entire address] [[https://www.youtube.com/watch?v=hAGMsOFL8WMHYPERLINK “https://www.youtube.com/watch?v=hAGMsOFL8WM&t=138s”&HYPERLINK “https://www.youtube.com/watch?v=hAGMsOFL8WM&t=138s”t=138s]] available, once again. 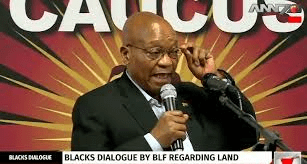 Zuma was speaking at a “Blacks in Dialogue” event in Braamfontein, Johannesburg, under the sponsorship of Black First Land First (BLF). … was forced [by Governor Somerset in 1817] to cede land between the Great Fish and Keiskamma rivers to the British. As you hear, he [Xhosa chief Ngqika] was not asked, he was forced to do so. [applause] And they were doing it all over. One of the Zuma chiefs [had been] near Pietermaritzburg, the town called Howick,— all of that area belongs to the Zumas. We’re claiming it! [laughter, applause] We’re claiming it. They came, the British, to say, “Look, we ask you to give a small portion; we want to establish a town.” He said, “No. I don’t want it.” They went away. They came a second time with weapons and soldiers and guns, and said, “We have come to ask this piece of land.” [laughter] He realized this now was war, and said, “Well, you can just use that space only,” as if that was not enough. Once they realized how fertile the ground was,— You know this big dam, Midmar Dam, it’s actually supposed to be Zuma Dam. [laughter, applause] After some time, they said, “No, can you just go to the other side of the mountain, so that here we will do something,” and they were establishing farming. All those farms there, the majority of them, are British owned [inaudible]. The critical point is that they had every power we didn’t have, to colonize us. We fought, though—seriously. In 1818, the British invaded the Xhosa territory, by attacking Ndlambe, who was one of the leaders, and seized 23,000 cattle, marking the outbreak of the Fifth War of Dispossession. Subsequently, those Xhosas and those communities whose cattle had been seized, rallied behind Makhanda ka Nxele, who led an attack of 6,000 warriors on Grahamstown. They provoked us. They did everything. In 1825, Landdrost [Cape Colony Magistrate] Andries Stockenstro@aum—or room or rome, I don’t know [laughter]—begins issuing temporary permits allowing white farmers to graze their livestock north of the Orange River, but they were not allowed to trade or erect buildings. This changes later in the decade, as farmers stop asking for permission and simply inform the magistrate. Bambatha, a Zulu chief, led the last military action against the British occupation forces, in 1906. Here, Chief Bambatha (right) and an attendant. 1828: Ordinance 49 of 1828 is passed. The ordinance allows the government to source laborers from “frontier” communities. All black workers were given passes for the sole purpose of working, and all contracts over a month long were to be registered. So, systematically, they began to want to know each and every one of us. You must carry a pass, you must be registered, you must be known. [That was] partly also to prevent us from fighting, because they can easily identify us. In 1829, January, Maqoma raids Bawana, a Thembu chief, forcing the latter’s followers to flee across into territory seized by the colonialists. Stockenstro@aum got the expulsion of Maqoma from the Kat River Valley and establishes a settlement for landless Khoi, to create a buffer zone between the Xhosa community and white settler farmers, and to consolidate territories seized by the colonialists. Maqoma responds by increasing cattle raids on white farmers, forcing them to informally allow him to return to the territory. In 1833 and 1835, in December, the Xhosa community launched an attack on the British after [Xhosa chief] Xhoxho was injured by a British patrol, sparking the Sixth War of Dispossession. So you can count a number of incidents where we were provoked. They covered, in actual fact, the entire country. They moved throughout, they attacked, [inaudible]. There are these guys, like Sir Benjamin D’Urban—I don’t know why was Durban named after this fellow. [Inaudible] And there was annexation after annexation. In 1837, voortrekkers [Afrikaners moving from Cape Colony to the interior to get free of British rule] under the leadership of Hendrick Potgieter defeated the Ndebele under Mzilikazi at the Marico River, and seized vast tracts of land between the Limpopo and Vaal rivers. It must be noted that Mzilikazi is one king who was effectively exiled by the Boers and seems to have been written out of South African history. He had to cross to Zimbabwe finally; he went to Botswana, then crossed to Zimbabwe. And he had had quite a big kingdom. In 1838, in May, the voortrekkers led by Andries Pretorius fought and defeated the Zulu at the banks of the Ncome River, called the Blood River, and dispossessed them of their land. In fact, they took the whole area in the south of the Tugela [River], naming it Republic of Natalia. It only changed later, when the British took it, and they called it Natal. The Battle of Blood River, 1838. Voortrekkers, led by Andries Pretorius, defeated the Zulu at the Ncome River and took possession of the area from the Tugela River to the Umzimkulu, to form the Republic of Natalia. In 1844, the British threatened Natalia and then took it over, renaming it Natal . It’s countless, the accounts where they went. They even went to the Sekwatis [royal family of the Pedi], particularly the Afrikaners went, Hendrick Potgieter. He also signed a treaty there. So there is no corner of the land they did not touch. The point I’m stressing is that this was long before 1913. [applause] You can deal with many instances that will indicate that indeed, long before 1913, the land was taken—to everybody, to every community in South Africa. There are details that will always, in a sense, support this view. It is absolutely important for us to be aware of this, and I think we need, on this matter, to put our facts together, as the Black Caucus, instead of just demanding our land. But let those among us who can put it together, and articulate it, present it to everywhere. And I would be happy if you could go and address Parliament [applause] about those matters. In 1848, in February, a government land commission established during the year, states that the extent of land recommended by the 1846-47 commission is excessive. The commission apportions land to white settlers. This point of settlers is important for us to appreciate: That part of our difficulties in South Africa is because we have the biggest number of European settlers—in the whole world. [applause] And we’ve got to appreciate that therefore, the resistance to giving land is going to be very serious. Many countries in Africa were colonies. Once they were decolonized, the administrators packed their bags and left. Here, we used to call it, Special—hmm? [audience responds, “Colonization of a Special Type”]. Exactly, Colonization of a Special Type, where the colonizer lives with the colonized. In 1850, Sir George Grey confiscated land from black people, leaving them to search for work on farms. The taking of the land—one of the things that encouraged it, was to make blacks, particularly after the discovery of diamonds and gold, that they should go and work. If they had land, they would be able to leave, and so it was important to deliberately dispossess them. There were many things they introduced, in order to force us to go and work, so the taking of the land created the labor force. We were people, in our country, citizens [indistinct], doing our land, everything. We’re then turned into laborers, because the land had been taken from us. 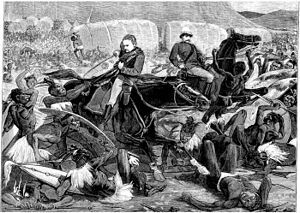 In 1852, the British under Sir George Cathcart attack the BaSotho under King Moshoeshoe. And it was the same, until King Moshoeshoe asked the British to help. General Sir George Cathcart, governor of Cape Colony, attacked the BaSotho people under King Moshoeshoe in 1852. In November 1853, a resolution taken by the Volksraad [Afrikaner legislative assembly in the Transvaal] enabled District Commandants to grant land for occupation by Africans on condition of “good behavior.” [laughter] And “good behavior” was simple, be kind to them, don’t fight. However, under the resolution there was no individual title. Africans had to use the land communally. Chiefs were regarded as trustees of the tribe. However, power over the land still remained the hands of the white government. “Be kind, the land is not yours, it’s just your chief is keeping it in trust.” So, all of that. 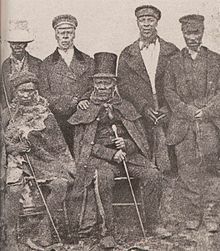 King Moshoeshoe of the BaSotho (1786-1870) with his councilors. After repulsing the British and then the Boers, Moshoeshoe lost extensive territory to the Boers in new attacks. Moshoeshoe eventually turned to the British for protection in 1867. See Basutoland on the map (now Lesotho), an enclave within South Africa. In 1855, in June, Resolution 159 is adopted by the Transvaal government. It prohibits anybody who was not a burger [citizen] from owning land and also prohibits Africans from having burger rights. So there were laws and regulations made just to keep you away from land. 1856, voortrekkers declare an independent Zuid-Afrikaansche Republiek, and lay claim to the Transvaal,— You must not like my Afrikaans. My Afrikaans is prison Afrikaans. [laughter] It is very different. In 1857, in April, Lieutenant General Scott issues a proclamation offering vacant Crown lands which are between 300 and 3,000 acres. This increases land speculation by white settlers who, in turn, after purchasing the land, lease it to Africans, at yearly rental of 5 shillings. So, with time, it becomes stronger and stronger. In 1958, the First BaSotho-Boer War breaks out as a voortrekker commando attacks Thaba Bosiu. In response, the Sothos mobilize an army of 10,000 warriors who raid unprotected settler farms and defeat the voortrekkers and force them to retreat. This battle continued for some time, until Moshoeshoe asked for the British to protect, and then that’s how Lesotho becomes the British protectorate, protecting themselves from the Boers. This happened in every other area, until they covered the whole country. Kingdoms fell; some disappeared. After pushing some people across rivers, they will put on the other side, the line of soldiers that are waiting for people to cross. The British invasion of Zululand (north of Natal, see map), in 1879, led to the Battle of Isandlwana, in which the Zulu inflicted a humiliating defeat on the British. Here, two British officers retreat from the battle (seen faintly in the background). Of 57 British officers, five survived. The British lost a thousand rifles, their two field artillery guns, 400,000 rounds of ammunition, most of the 2,000 draft animals, and 130 wagons. The critical point is that the issue of the land needs to be discussed properly. We need to discuss it fairly. We are not saying these people should have no land. We say we can’t remain without land, when they have land. We must find a formula. We tried to work out on a formula, willing something and willing something. [laughter] Willing seller, willing buyer. 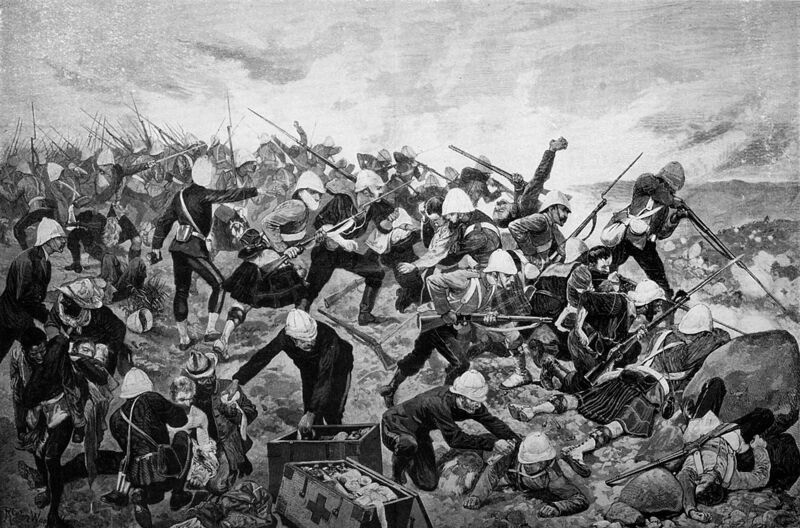 The Battle of Ulundi, 1879. 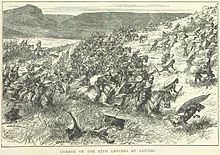 After their defeat at Isandlwana, the British attacked the Zulu anew at Ulundi, with a changed and reinforced order of battle, and prevailed. They captured and deported King Cetshwayo and broke up the Zulu kingdom into 13 chiefdoms. Audience member: Willing buyer, willing seller. In 1879, Zulu warriors defeated the British at the Battle of Isandlwana, January. 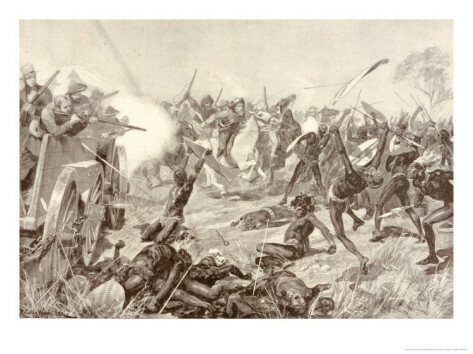 The British forces are defeated by the Zulu impis [warrior formations], at the Battle of Isandlwana, indeed. In November, the Pedi under the leadership of Sekhukhune are defeated by British forces, leaving about 1,000 Pedi warriors dead. Sekhukhune is captured and imprisoned in Pretoria. Just look how the kingdoms,— which have been destroyed without any second thought. In the Cape, the government annexes Fingoland (amaMfengu) and Griqualand West, which constitutes two-thirds of the territory between the Cape and Natal. In 1882-83, white farmers lay a siege of Ndzundza (Ndebele) for nine months, who when faced with starvation, are forced to surrender. Their fertile lands are seized and divided among the voortrekkers. Each war participant is given five families to use as servants, who work for little or no pay on the farms. 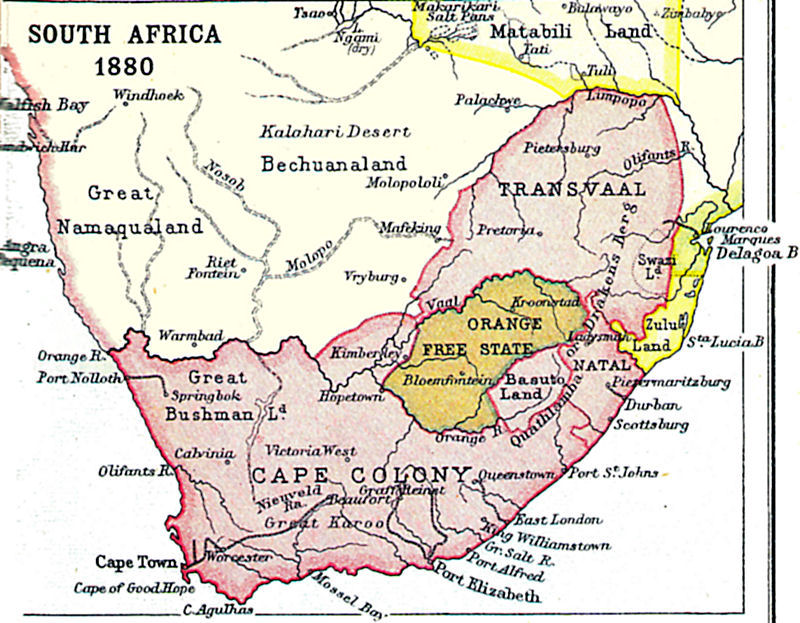 1885: Gcalekaland and Thembuland are incorporated into the Cape Colony. So anything that was remaining, is taken. This is a story of the land, how it was taken, and how we became landless. The last one—there are many—the last one was the introduction of poll tax, which made Chief Bambatha to rebel. Chief Bambatha kaMancinza, of his own [applause] led a bloody revolt and defeated the advancing British law and forces who were trying to fight him. [He] dealt with them, but they organized; more reinforcements were sent in to try and capture him. He fled and operated from the Nkandla Forest and continued to build a resistance army and conducted a guerrilla warfare, together with Chakijana. The white troops in the area were faced with that fight, including the leaders, chiefs who agreed to pay poll tax. Chakijana had formed the guerrillas. They dealt with them. That led to the arrest of King Dinizulu and indeed, Bambatha was defeated. This was the last resistance from us, as Africans. It sent a very clear message that the methods we have been using so far did not work, to make us defend our land. And made our forebears to take a decision to fight differently, to use the political methods to fight, because land had been taken. Very serious situation, because in a clash between the Afrikaners and the British that led to the Anglo-Boer War, as it was called then, the main thing is that the land had become a big issue for the British. They did not want Afrikaners to have what you call the republics [the South African Republic and the Orange Free State], without them controlling. And that’s why that war occurred. And finally, the Afrikaners were defeated. They then put together a new country, the Union of South Africa. Now, if we say, by 1910, the whites, who were fighting among themselves, had reached an agreement to put together all four republics and make one Union: Why do we think, after 1910, the land was not taken away? [And that] it was only taken away in 1913 [by the Natives Land Act], and [that] that’s where we should claim. I think it’s an issue that needs us to deal with, logically. Because it is the 1910 Union establishment which put all of us blacks out; only whites [had rights]. We had no vote, we had no participation in Parliament, in localities, everywhere. That’s what made those who felt we now have to fight differently, to form an organization for the first time. And every, every community was represented in Bloemfontein [at the founding of the African National Congress in 1912]. The British could not tolerate the existence of the Boer republics and provoked the First Anglo-Boer War against the South African Republic (Zuid-Afrikaansche Republiek, shown as Transvaal on the map), 1880-1881. Here, the British attack the Boers at Majuba Hill in 1881. The Boers prevailed, but conceded defeat in the second war, 1899-1902, and turned to political methods against the British. And that shows, when we are feeling good, we say these were “old people,” who are not as bright as we are. We can now operate and manipulate high-tech things. Certainly we believe we are actually better than those. Hmm? [speaking in isiZulu:] “They couldn’t drive cars. Even riding a bike, they would fall off.” [laughter] We fly planes today—but we can’t see the sense that Africans must unite. [applause] That is my biggest problem….